This is a good stuff for our anesthetists and their autopilot systems. Using it will save their time more for other works at cheaper cost. Here is a Prototype F/OSS Slow Infusion Syringe With Arduino & Servo Motor With Video Demo with Insulin Syringe Pumped in Piston Movement. Copyright of this prototype is not released, hence the reader can use it only for non-commercial, personal usage. The care towards the readers is for preventing various companies to taken patent on it. It uses very easy mechanism. Normally seen commercial Slow Infusion Syringe use gear rail and gear with servo motor controlled by a microcontroller. There is no question of using open source and free software in current commercial health care products. There is F/OSS development of gear rail and gear with servo motor via 3D printing. But, basically that is good for certain situations. Not always we need the pull action. Only push of a loaded syringe is needed. Quite obviously, if the mechanism is basic, the cost of production goes lower and the unit becomes very small. The servo motor will rotate and the metallic arc will move and convert the rotational movement to linear movement. For demo purpose, 20 IU to 10 IU movement is shown. Servo Motor is normally completing a movement in very slow movement like the code we used for testing Tower Pro SG 5010 servo motor and Arduino. Then it coming back and starting a fresh cycle of movement. Mechanically the whole stuff is adjusted with inertia of motion in a way so that, each hit will deliver slight movement of the piston. This action is enough for liquid drug delivery to IV line for the non-precise drugs in many clinical settings. So much precision is not needed for mixing antibiotics, MgSO4, pentazocine like drugs and other stuffs. Its very painful to the thumb to push the syringe for many patients in slow motion. Charging to bottle is often too slow. It will need USB power to run. Adding an infrared sensor will make it “automatic model”. When the plunger will hit the needle hub end, then the infrared sensor will break the loop of hitting the plunger. Switching on always manual. There are tubes available to connect with syringe hub. With couple of back flow valves, injecting the syringe’s fluid distal to IV cannula will avoid changing the syringe too frequently to maintain sterile barrier. It is also good for intra operative operative site works. Sterilization of the whole small stuff is quite easier. Putting it inside a double walled sealed sterile bag will do the trick. There are robotic grasper available. Modifying the tips to secure a syringe will work fine. If you continuously want to pump, modifying the code will work fine. If you use that commercial robotic grasper, it is just ready and of pocketable size with a servo motor. From sucking lignocaine from bottle to infiltration, all can be done. A gun like body/housing will do the trick of easy holding. Upload code according to need. Code is the same which was used for testing Tower Pro SG 5010 servo motor and Arduino. Diagram is shown here, there is factually nothing new to show for the circuit part, that is same circuit like we used for testing Tower Pro SG 5010 servo motor. This Article Has Been Shared 5376 Times! 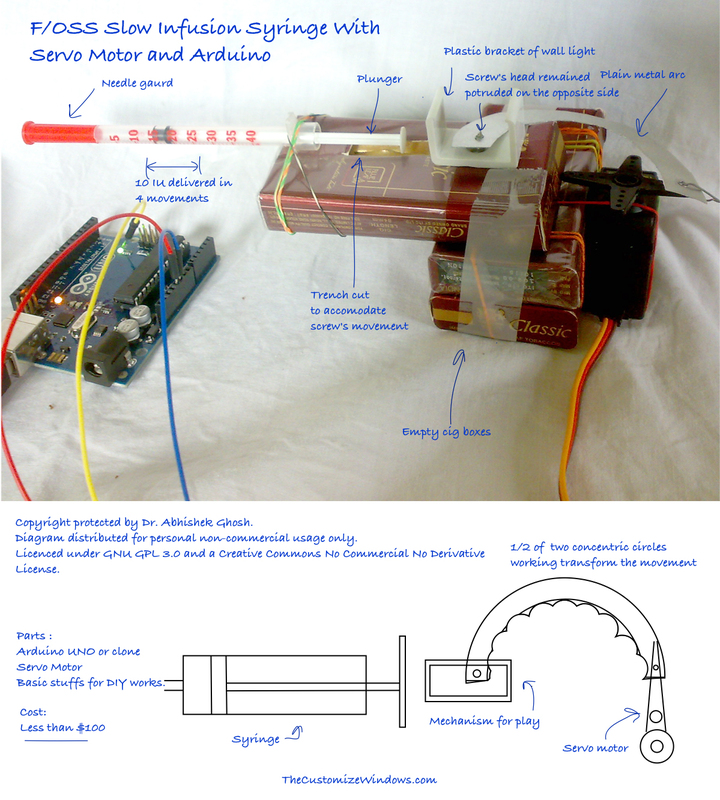 Cite this article as: Abhishek Ghosh, "F/OSS Slow Infusion Syringe With Arduino & Servo Motor," in The Customize Windows, January 28, 2016, April 26, 2019, https://thecustomizewindows.com/2016/01/foss-slow-infusion-syringe-with-arduino-servo-motor/.